The sky at 10:30 p.m. local time from midnorthern latitudes on April 6. As we get deeper into the spring season we must reluctantly bid farewell to the dazzling jewels of the wintertime skies. Orion and his retinue are still visible-albeit briefly-in the western sky soon after sundown. A long time friend of mine, and an assiduous amateur astronomer from Long Island, NY, Sam Storch, once confided to me that this time of year holds a touch of sadness for him: "It's like when we say 'so long for a while' to good friends, even though we know that they'll be back." These stellar friends will return to our evening sky in December, but for those of you who (like Sam) can't wait, you should set your alarms for 4:30 a.m. in mid-August. But as if to compensate for the loss of our brilliant winter stars, nature has provided us with a striking and well-known pattern which this week stands almost directly overhead at around 10:30 p.m. local daylight time: the seven stars that Americans call the Big Dipper, and many other cultures regard as some kind of carriage or wheeled vehicle (to those in Great Britain it's known as the Plough). Regardless what these seven stars portray to various peoples, to Western civilization they have always been part of the larger constellation of the Great Bear, which we call Ursa Major. The stars immediately to the west and south of the bowl of the Dipper form a pretty good stick figure of this creature. 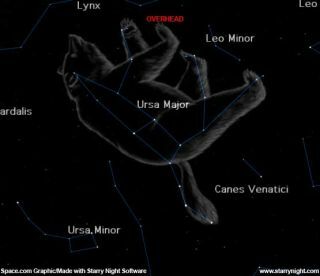 Here's an aside to our Internet friends who live south of the equator, for this is the time of year that you'll get your best views of Ursa Major and the Big Dipper. But rather than see them nearly overhead, these stars appear oriented in the northern part of the sky; the farther south one goes, the lower in the north these stars will get. Probably the most unusual view of the Big Dipper that I ever had was when I led a Halley's Comet tour to Easter Island in April 1986. From latitude of 27.1-degrees south, I could see the Dipper hovering just above the northern horizon-upside down! Interestingly, back home in the fall, I can sight the Dipper sitting at a similar distance above my local northern horizon, but right-side-up. The upside-down Dipper however can now be glimpsed as far south as 30-degrees south latitude, which includes many far-southerly locations, such as Johannesburg, South Africa, Asuncion, Paraguay and Sao Paulo, Brazil. Paradoxically, much of Australia can also see the Dipper now, as about three-quarters of the land area of that country is located north of latitude 30-degrees S. But unfortunately, most of that country's population is distributed south of 30-degrees S! What is really remarkable about the Big Dipper stars is that in one way or another they've always comprised a bear to widely separated early peoples-not only to Old World ancients but New World Indian tribes as well. "Imagine that Jupiter, fearing to come too nigh unto her teeth, layde holde on her tayle, and thereby drewe her up into the heaven; so that shee of herself being very weightie, and the distance from the Earth to the heavens very great, there was a great likelihood that her tayle must stretch. Other reason know I none."